The best 1911 magazine for you is out there. The challenging part is wading through all the ones that are available on the market. There are magazines that are not worth spending money on, even if they are cheap. That's because the quality probably won't be the best. To make it easy for you, we've done the hard work and have chosen seven of the best 1911 magazines that are currently available. One of them may be the next one you buy and probably the last one for a while. The thing to keep in mind is that not all magazines will have the same capacity. Some will have a maximum capacity of ten rounds, while some will have an upwards of 12. Either way, having multiple options should be essential, especially when you’re out target practicing or taking part in competitive shooting contests. Going back to the competitive shooting example. Having multiple options on hand will allow you to load and reload faster. In the interest of time, you don't want one where you'll have to load rounds one-by-one. This may also be a great benefit if you're testing out different magazines on the range to determine which one will be best for your 1911. The biggest advantage of having a variety of magazines is having a spare when disaster strikes. By disaster, we mean when the device malfunctions. There will come a time where that will happen. The only obvious solution is to replace your malfunctioning magazine with one that has not been used yet. Some buyers have often bought their guns and accessories on the name alone. If they are longtime buyers of the same brand name, there is a reason or two why they keep on buying it. Sometimes, you have to go beyond the name itself to make sure if it's one that you want to trust. Obviously, the price is a factor in every buying decision. You may have some money to play around with or you're probably on a budget. Either way, the price is a deciding factor. Yet, there is a major caveat for this. In order to find the best option for yourself, you want to consider the quality over price. You do not want to go for cheap since cheap is associated with bad quality. Luckily, there is a rule that you'll need to follow: find the best quality that you can afford. Thankfully, there are some on the market that are high in quality and fair on price. This is another factor that should be worth considering. This focuses on the pressure in the springs of the magazines. There are devices that have different levels of pressure in their springs. 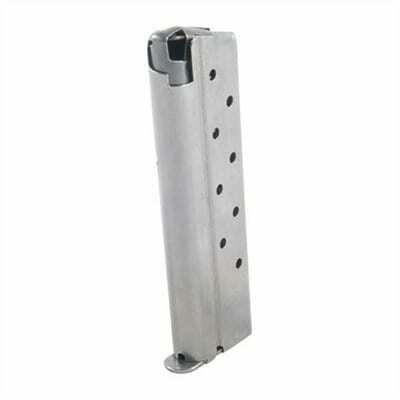 Magazines for 1911s have higher pressure in their springs for maximum performance. This is something that you’ll want for your own use. Obviously, this is a factor that entails the quality of your device. This also includes the aesthetics as well. Most will have a highly reflective finish and will show it when held up in sunlight. However, some users may not desire a reflective finish for a few reasons. A shiny finish may be associated with poor grip. This is even worse if your hands are slippery due to water or sweat. It would be wise for you to find a product that does not have a reflective finish. Having a better grip is much more of a need than having it look good. Finally, it should be able to eject quickly and smoothly. This is an excellent feature that may come in handy in the event of a competition or if it decides to malfunction. 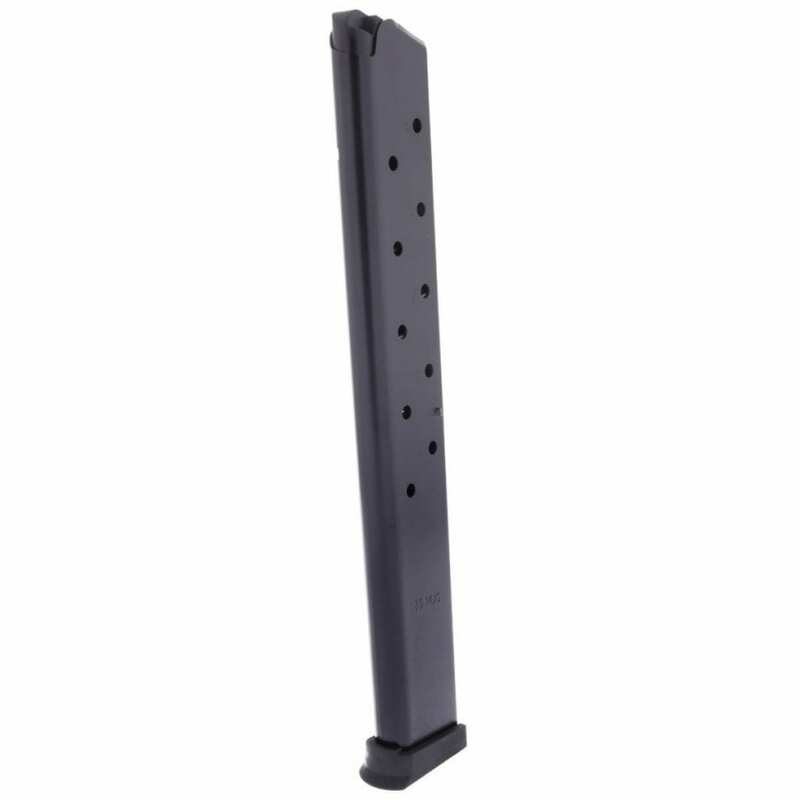 If you need multiple magazines for spares, having a no-stick one is key for when you need to load and reload rather quickly. Having a reliable, functional back-up magazine or two will be beneficial in a variety of circumstances. We’ve uncovered the best on the market and given you an overview of each of our picks to help you decide which one is right for you. The first magazine we’ll look at comes to us from Palmetto State Armory (PSA). This is a stainless steel option with a seven round capacity that fits PSA-issued 1911s and also other models. If you have a 1911 that is a standard government issued gun and can work with government magazines, the PSA is a good alternative to have when you need an extra magazine or two. If you want a product that is guaranteed to last you even through hundreds, if not thousands of rounds, you should consider the PSA as a possible option. This is considered to be one of the best on the market (of course, as it has the top spot in this article). Palmetto State Armory is a reliable brand for most 1911 users. Some will have good things to say about them, others not so much. If you want something with a low count capacity, you can rely on this one in particular. One advantage you might have is the lower the capacity, the quicker you can replace it with an additional magazine. That might be a good strategy to have if you’re a competitive shooter. As mentioned earlier, there are 1911 magazines on the market that are great in quality, but fair in price. One brand in particular that makes gun accessories and sells them at a good price is Wilson Combat. They are highly recognizable and one of the more trusted brands when compared to others. If you’re on a budget, you’d be insane to pass on anything made by Wilson Combat. This product that we’ll be looking at is no exception to that rule. The aircraft-grade stainless steel is has been heat-treated to protect the weapon. It can easily perform under continual usage in competitions and self-defense situations. The body is precision formed, with near perfect tolerances for a universal, excellent fit. The Wolff spring is built to alleviate and prevent “spring set”. When it needs cleaning, the base, follower, and spring remove easily for quick access and easy maintenance. If you have a black model, you can choose a black oxide finish along with a steel base pad that can be removed when needed. Wilson Combat is arguably one of the best brands on the market and for good reason. If you’re the kind of gun owner that typically sticks to a budget, you’ll want to find a brand that you can rely on for a long period of time. If you’re looking for a product that will last you years, the Wilson Combat is what you’ll probably want. If one user has had this kind for thirty plus years, it might be the last magazine you’ll buy in a long time. And for the affordable price, that is quite a steal. Our next magazine up for review is the Brownells 1911 9mm. If you're in the market for a 9mm compatible device, Brownells is currently the best on the market. This combines heavy-duty construction with the reliability that you expect from a century-old service weapon. Both the body and follower are constructed from heat-treated stainless steel. This also has a witness hole for a fast round count. The exterior is coated with Xylan, which is used to ensure that it is protected from corrosion. The finish is also designed to reduce friction. 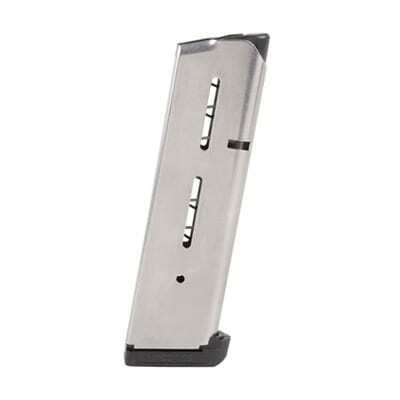 This has a removable polymer base pad that allows you easy disassembly and drop protection when you want to switch out magazines. If you want a good magazine for your 9mm 1911, the Brownells may just fit the bill. One of the main things that stands out is that it can fit just fine and you can slide it out without experiencing any issues. This is something you’ll probably want in the interest of speed and timing. With the witness holes, you can reload it faster. Not bad for a mag that can hold ten rounds. May Not Perform as Well as Other Brands Like Kimber. 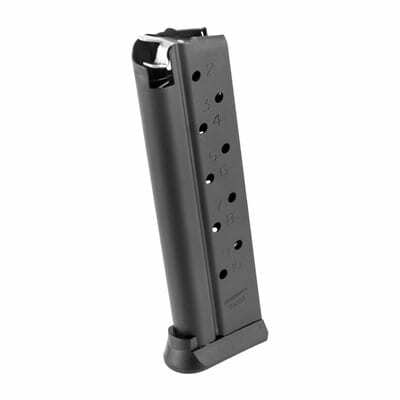 Up next, we have the Metalform 1911 10mm Magazine. Currently, this clip is the best fit for 10mm 1911s. This has a capacity of eight rounds. It is crafted from blued carbon steel and stainless steel, making this a robust, high-quality product for your gun. Since this is made in the U.S.A., you'll know for sure that this will be a high-quality gun accessory. That's because manufacturers in the United States place quality at a very high standard. You can choose from flat or round steel followers. Both are created to provide a positive last-round feeding regardless of bullet type, especially wadcutters. It also has a safety orange nylon follower that is concave and has the ability to hold additional rounds. One of the major things that stands out for this product is the orange nylon follower. This is perfect for those who may have bad eyesight and have a hard time manually loading the mag. Other than that, this is a very strong product to have. If you somehow drop it by accident, it won’t get dented, scratched, or sustain any kind of damage. That’s the beauty of having this puppy constructed with two kinds of durable steel. 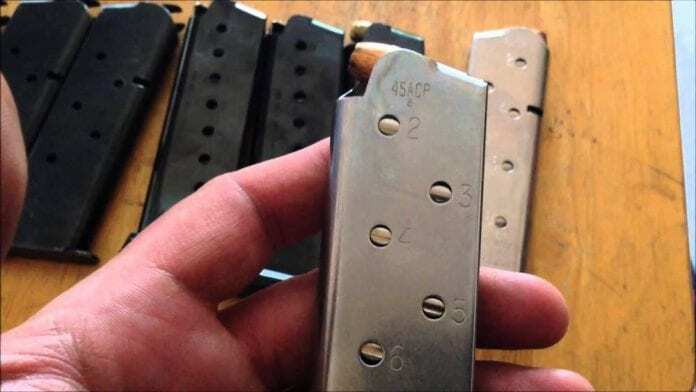 Not all 1911 magazines have a set round capacity across the board. Some have a capacity of seven or eight rounds, while others will have an upwards of about 15. The Springfield 1911 is the best one on the market for someone who is looking for a great eight rounder. This is also the perfect option to have for your 1911 if you’re looking for something to replace your current or a factory magazine that just doesn’t get the job done. 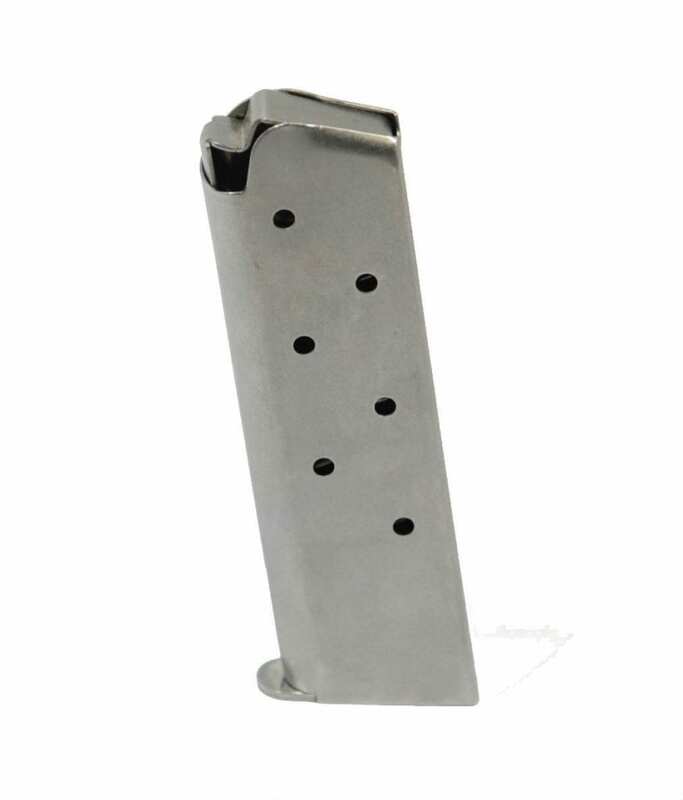 This is crafted from stainless steel material, making it very durable for your 1911. According to a reviewer on the PSA website, these clips are apparently hard to find. So, if you’re looking for a good eight round option, the Springfield might just be your best bet. The Springfield Armory 1911 magazine might be your best option if you're looking for a good quality product that can hold up to eight rounds. One of the best things about it is that you won't have any issues while it drops free and it will be easy to load. In competitive shooting, having the ability to quickly and easily load additional magazines into your 1911 will make all the difference. If you're a competitive shooter and need an eight rounder that will deliver, the Springfield may be your best competition buddy. The next 1911 item is for those looking for a great ten rounder. 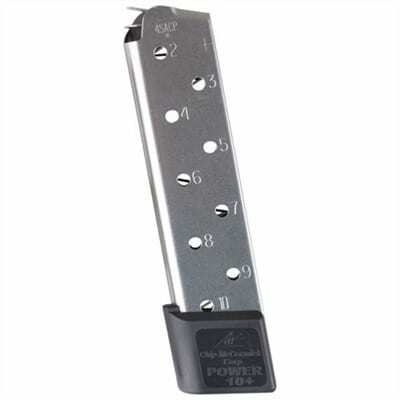 This is the Chip McCormick 1911 Ten Round Power Plus magazine. This is a brand name that a lot of 1911 gun owners and enthusiasts are quite happy with and for good reason. Chip McCormicks are built to be that never-fail product for 1911s. Magazine failure is the last thing a competitive shooter wants to go through. The same can be said in home defense situations. A failing mag when your life's on the line can put you in a more dangerous situation. It features roll formed feed lips, which are not die cut, but polished, to add strength. The design of the follower enables effortless feeding even with hollow points and semi-wadcutters. This also has a powerful proprietary spring and a Rocket wire coated in a heat treatment designed for reliable feeding, especially when the pistol is fully loaded and seated in a pistol for extended periods of time. The plastic base pad is removable and is made to stand up to continuous use. To ensure a visible and fast load count, numbered witness holes are featured on either side. There are some brands out there that 1911 lovers can’t say anything bad about. Chip McCormick is one of those brands. If you want an item that won’t fail you, especially in the times when you want your 1911 to work the best, you’re going to want to further consider getting a Chip McCormick. If you want a good ten round option, you’ll be hard pressed to find anything that is just as good as this one. Our final review is for those who want the best 15 round magazine for their gun. KCI combines high-quality construction with very reliable performance. This is one of the best magazines to have if you're going to spend the day out on the range. The steel construction and polymer base plate are durable and also feature witness holes cut into each side to allow for ease of loading. This is compatible with full-size, mil-spec, and commander variants, and extends beyond the magwell by a few inches. If you want to double down on your firing power, the KCI has extended options available. This is the perfect magazine for your 1911 if you hate the idea of having to reload every seven or eight shots. This also comes in handy if you want to spend all day at the range and fire off your 1911 with pride. The KCI is your best choice if seven or eight rounds just won’t cut it for your pistol. These are known as G.I. spec types. These were used as part of the government issued sidearms for the United States military. These will typically have a round count of seven or eight. Nothing more or less than that. The hybrid 1911 magazines are designed to function with great reliability. This allows the rounds to spring free from control at a faster pace in the feeding cycle. If you’re using hollow points, this type will work perfectly with them. This works perfectly with JHP ammo. They are also designed to prevent double feed. This is accomplished by allowing shorter rounds and using the same kind of feeding angle as a rifle magazine uses. Finding the best 1911 magazine doesn't have to be a challenge. If you see one that stands out as one of your favorites, be sure to do a little more in-depth research on that product. There’s probably a reason it has piqued your interest. Take all the reviews with a grain of salt and use your best judgment to make sure if it really is the best magazine for you.